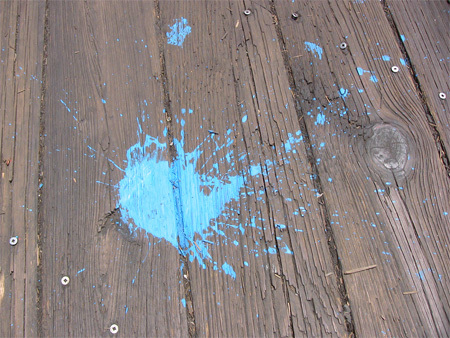 A dispatch from Global Smurfs Day. But, really, isn't every day? By 11:40 a.m., the sun is blazing and the Smurfs are being urged into a pen. 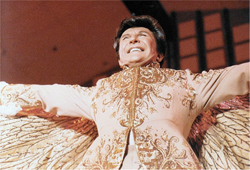 A man in a seersucker suit is hollering into a megaphone. Everyone get your blue makeup on! he cries. Get it on! He’s been there since morning, but he is no Smurf expert, he confides to me. He is simply there, he says, to help get the job done. 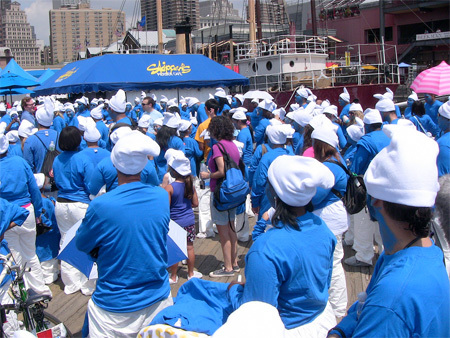 New York’s South Street Seaport is awash in blue and white. A young man handing out Tyvek Smurf pants gives me the lowdown. I’m no expert, he confides, I’m just a volunteer, but basically, this is Global Smurfs Day. We — meaning Columbia and Sony Pictures, makers of the upcoming live-action movie The Smurfs (in 3-D) — are here to break the world record for the largest-ever gathering of humans dressed as Smurfs [NB: officially titled Largest Gathering of People Dressed as Smurfs within a 24-hour period in Multiple Venues]. It’s happening all over the world, the volunteer says. All we need here in New York City is more than 250 Smurfs and, as you can see, he says confidently, we will definitely break that record. People, he said, had been getting blue together all over the world — in Brussels, Athens, The Hague, Dublin, Ireland, Mexico City, Panama City, Warsaw, Moscow, Johannesburg, and London. June 25 also marks the 83rd birthday of Smurfs creator Peyo, who is unfortunately not alive for the celebration. It’s been more than 50 years since Peyo first introduced the Smurfs in comic form in his native Belgium. Something about this mysterious race of human-like blue creatures only three apples high, who inhabit mushrooms in a village somewhere in Middle Ages Europe completely charmed the public. Within a year or so of their creation, the comic had spread across Europe. 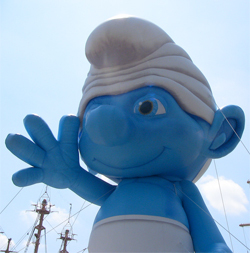 The craze for Smurfs was underlined by a slew of merchandising — Smurf games, Smurf toys. The entirety of the Smurf village could be purchased one plastic figurine at a time and many fans did just that. In 1981, Hanna-Barbera Productions gave the Smurfs the television series on NBC for which they are best known today, in a prime Saturday morning cartoon slot. 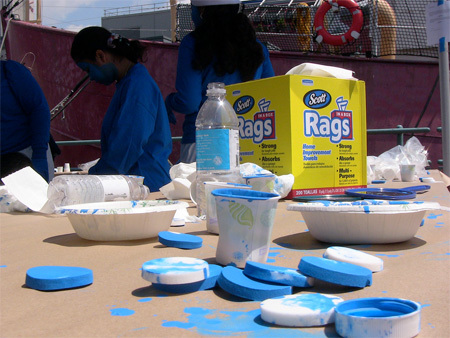 Merchandising continued to grow — Smurf games, Smurf clothing, Smurf cereal, Smurf pasta. Generation Xers across the globe absorbed Smurfs into their psyches and their bloodstreams. No one knows where the Smurfs live, save the Smurfs themselves and the children who watch their adventures. In the Smurf village, everyone plays a simple, defined role. There is Painter Smurf, whose role is to paint wonderful “master pizzas,” and Brainy Smurf, who adds an air of bumbling but heartfelt pretension to the village. There is Jokey Smurf, whose love of playing the same trick over and over on his fellow Smurfs — the gift of an exploding present — contributes a repetitive and predictable source of hilarity to the community. There is Smurfette, the sole female Smurf, and a large community of minor Smurf characters, all delineated by profession or prevailing sensibility: Farmer, Poet, Clumsy, Dreamy, Lazy, Sloppy. They are presided over by Papa Smurf, a robust, white-bearded fellow of 545 years. From day to day, the fun-loving Smurfs have adventures one might expect in a magical village: mishaps with spells, run-ins with dragons, and the like. But most of their activities are built around thwarting the evil wizard Gargamel and his cat partner in crime, Azrael. Gargamel’s stated raison d’etre is to capture enough Smurfs to alchemize into gold, but he really lives to find the Smurf village and wreak vengeance upon the smug blue creatures who, for their part, seem to revel in the perpetual humiliation of the blundering wizard. Within these strictly determined roles — despite the ongoing fear that their secret Utopia could at any moment be invaded and destroyed — each Smurf lives happily. Stretching out to the street, a line of New Yorkers wait to sign their release forms and get Smurfed out (“Your presence on this set constitutes your granting to Sony Pictures…in any and all media, in perpetuity…without limitation…your name, voice, and/or likeness….). For their mission, the public is given a pair of white Tyvek pants, a long-sleeved blue shirt, white felt Smurf hats, and white hospital booties to cover their shoes — one size only, that size being huge. Some parents have slipped blue latex gloves over their child’s hands to complete the look, but the sun is topping 80, and the gloves dangle from little wet hands. All along the pier, moist children are already sliding out of their costumes. 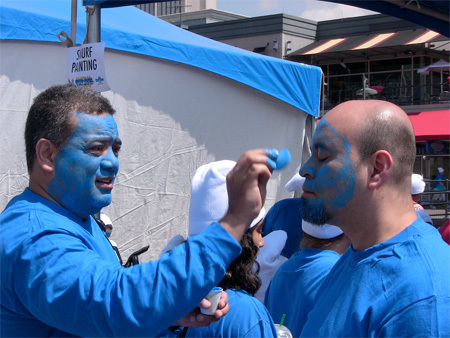 At the face-painting station, women are helping children get their blue-face on and grown men are painting each other, giggling. Some men choose to work alone, setting about their task with gravity. The clock is ticking, and a low-level anxiety is taking hold of the crowd — most of the Smurfs must be satisfied with some elemental smears about the forehead and cheeks. There just isn’t enough time to do a proper job. Come on, Smurfs! the megaphone blares. Dazed, silent children in floppy Smurfgear — dragged along by gleeful blue 20- and 30-somethings — are consoled only by the promise of raffled-off chocolate. This, and the face paint, appear to satisfy them. Who can say why face paint is so soothing to the young? A college-aged woman dressed as Smurfette is asked by the press why she came to participate. I decided to do this, she says, at the last minute! I don’t know why we came, a group of grown men tell me, we just though it sounded like a fun thing to do. Did you like the Smurfs as children? I ask them. But of course, they tell me, doesn’t everyone like the Smurfs? 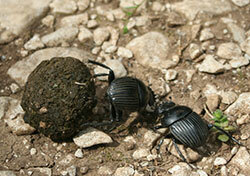 And him, I ask, pointing at the adolescent boy with them. I don’t know the Smurfs, the boy says, I’ve never seen them. It’s fun, I overhear a gray-bearded man tell a stranger. Blue is fun. It’s a multicultural crowd, with hardly a white person to be found. One by one, fans file into the Smurf pen, smiling at the tidy Guinness Book of World’s Records representative, who offers the crowd an approving nod and holds her clipboard tightly to her breast. Behind me, a building-size Smurf balloon supported by ropes reaches out to Manhattan with a fleet of clipper ships behind him, like a newly appointed Peter Stuyvesant balancing on his wood-and-silver leg, projecting his will onto that of the city. Our family were Cold War liberals and the Smurfs were obviously commies. Papa Smurf was a weak stand-in for Stalin, Gargamel the twisted, scheming Jewish other. Even as a kid I knew it was lame Euro-commie agitprop. My child will not be exposed to such drivel. — Alan K., U.S. The Smurf village — an idyllic medieval paradise hidden away from humans — is the core of Smurf mystery and Smurf controversy. For children, the village’s inaccessibility is fundamental to the Smurfs’ appeal. For Antoine Buéno — novelist and senior lecturer at the IEP (Institute of Political Studies) — the seclusion of the Smurf village is at the heart of its inherent fascism. Buéno’s recently published manifesto The Little Blue Book (Le Petit Livre Bleu), a “critical and political analysis of Smurf society,” posits that the happy Smurf village is the embodiment of totalitarian socialism. The omniscient and ubiquitous Papa Smurf is an authoritarian omnipresence set on protecting his domain through power and isolation. The Smurfs lack real individuality, says Buéno, not to mention private property. As for Gargamel, his hooked nose and obsession with gold is an obvious nod to anti-Semitism, with Gargamel meant to represent a looming capitalist threat to the socialist ideology of Smurf society. I loved the Smurfs. I watched them religiously every Saturday morning, along with various other cartoons. I remember little about them except for some of the characters (Brainy, Papa, Smurfette, etc.) And of course I remember the evil Gargamel and his cat Azrael. But I couldn’t tell you much about what went on episode to episode. But I loved them. — Emily G., U.S.
Matt wears no costume but does have his face smudged with blue for the occasion. I want to know how he had become a Smurfologist. I want to know what it takes. Well, Matt says, I’ve been part of the comic world for a very long time. I’ve seen every episode of The Smurfs — multiple times. And, he says, I’ve written a book about the Smurfs, coming out in August. What did he think of the whole Buéno controversy? Was there something insidious, poisonous even, festering in the marrow of the Smurfs? I’ll tell you, he says. Here’s what I think…. I step a bit closer. It’s a comic, Matt says. It’s just a comic. Yes, he agrees that the Smurfs live in a cloistered village and operate inside cloistered personalities. But, he says, this is the way of comics. If there is any plot, it is Buéno’s plot to get a book deal. He pauses. You know, Peyo was Belgian, he says. The use of the word “Schtroumpf” (the original French name for the Smurfs) or “Smurf” (the Dutch translation of Schtroumpf), as a stand-in noun/verb/adjective in the Smurf village — as in “that smurfing smurf is smurfy” — is meant to satirize the whole French/Dutch communication predicament in Belgium. Also, in his youth, Matt says, Peyo lived in a German-occupied Belgium, and created the Smurfs in the 1950s. So, he says, if anything, you can say that the Smurfs are anti-Nazi. Perhaps he is right. Perhaps it’s folly and pretension to look at every bit of pop culture with a critical eye. But the culture of our childhoods has power over us. Why wouldn’t children find a little medieval village inhabited by small people having adventures, positioning themselves as actors of good in an evil world of larger oppressors, appealing? It is our role as children to find the things we most love and embrace them with all our might, and our role as adults to question this love, to find fault in it, to be suspicious of everything we ever come to with complete sincerity. Still, I am itching to ask Matt, as the world’s leading Smurfologist, about the Phrygian cap. If anything at all can be read into the Smurfs, it has to revolve around the soft, white, cone-like Phrygian cap that tops every Smurf’s costume. The Phrygian cap was the hat of freed men in the Roman Empire, the sans-culotte in Revolutionary France, 19th-century anti-colonialists in South America. Look at the official seal of the United States Senate and right above the American flag is a red Phrygian cap exactly like that worn by Papa Smurf. The Phrygian cap is a symbol of liberty, of unity. Maybe the Smurfs aren’t meant to be seen as individuals, but individual traits of one complete Smurf entity. Could it be that this was Peyo’s way of dealing with the struggle for happiness within a communal Utopia? I want to ask Matt, but he is already off, eager to fill his role as the day’s hired Smurf expert. Everyone I know loved Hupikék Törpikék. It started playing here when I was about 8 or 9 years old. I have to confess that it didn’t remind me of our great socialist nation of Hungary! What I remember though is that those rubber Smurf figures were only sold in Austria, so whenever we went to Vienna and our father let us choose one thing at toy stores, it was always those that we picked. Nowadays any kid can get them with their Happy Meals, but back then they were everyone’s treasure in school and evidences of Western trips (and thus wealth). When it was playing here we still only had the two public (or state) TV channels. Those mainly played Hungarian and other socialist cartoons (which were great, by the way), but for us there was always a touch of added magic to see anything Western. I guess the Smurfs definitely had this. But at the same time I think that there is something great about it generally, something that has been working for decades. At noon the pen is closed off and the counting begins. The late, city-summer sun is working its way further into the blue jerseys, down the suffocating Tyvek. Sweat trails drizzle through the face paint. 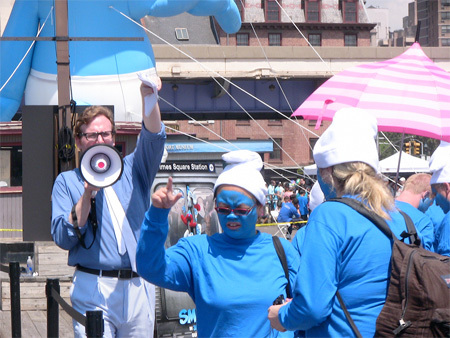 Megaphone to people: Are you really smurfin’ excited? Yay! A cameraman calls out to the crowd, inciting them to more ecstatic states. Hey Smurfs! Let’s get rowdy! Yay! YAAAY! the crowd replies. They lift their arms and spontaneously burst into the Smurf song. La la lala la la… The crowd sings louder and louder and the song devolves into a tribal chant: Smurfs! Smurfs! Smurfs! Smurfs! Smurfs! The megaphone man starts calling out raffle numbers but can hardly be heard above the din. At this point, the children — aching to be released from their Smurfness — desperately want to cry, but they maintain a veneer of composure. There are prizes yet to be won. Lingering at the fringes of the pen are a few dozen onlookers in ramshackle costumes. I can’t figure out why the headgear of these people look more like do-rags than Phrygian caps until a closer inspection reveals them to be white paper towels tied at the nape of the neck, filched (presumably) from the face-painting station. On their hastily blue-greased faces, regret, and a little shame. We’re too late, a woman tells her paper-topped children. We’re too late. It goes almost without saying that poor Gargamel was no one’s favorite. He existed simply to foil the protagonists. Gargamel was poorly dressed and greedy and bald. 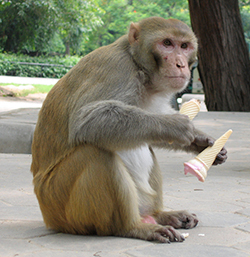 No child could sympathize with his thirst for riches. On the flipside was Papa Smurf: benevolent, wise. Papa Smurf could do anything — he was a doctor, teacher, lawyer, and parent all rolled into one. Plus, he was a better wizard than Gargamel. But Papa Smurf was nobody’s favorite, either. He was too powerful, too righteous. Also, we could never, ever forgive Papa Smurf his lusts. His momentary designs to marry Smurfette in that Spring fever episode sullied him, forever. Who can forget the vision of a desperate Papa Smurf lifting weights and groaning, “She loves me, she loves me not,” forcing Smurfette to take a mate in the village, suggesting that it should be him, knowing that she wanted none of them, knowing, anyway, that it could never be him? (“If you do decide to marry, you might consider an older, more mature Smurf of the world…Just think, you’d be know as Mama Smurf!”) Children can be amused by foibles and they can admire goodness, but they cannot love abstractions and never will they forgive hypocrisy. Simply being the only female in the all-male Smurf village made Smurfette the most powerful Smurf, and she wielded her control over fans and Smurfs alike. Smurfette was Gargamel’s creation, introduced into the homogeneous, all-male peace of the Smurf village as a saboteur, a deliverer of chaos. She was his Pandora, the original woman, woman as punishment. Like Pandora, she was composed of clay, as well as sugar and spice but nothing nice, crocodile tears, half a pack of lies, a chatter of a magpie, and the hardest stone for her heart. But she charmed herself into mainstream Smurf life, getting credit in the straight world by convincing Papa Smurf that she should be a real Smurf. He infused her with moonbeams, turned her black hair to gold, her slippers to pumps. She emancipated herself from Gargamel’s reign, and went on to make the Smurfs her slaves. It’s a common complaint in the adult world that there should have been more female Smurfs, but children never feel this way, nor do Smurfs. Smurfette’s femininity had more authority in the Smurf village than all the feeble masculinity of the Smurfs combined. Smurfette ruled them all. At 12:30 p.m., the ropes of the pen bulge. Can they get out? an assistant asks the Guinness lady, they’re desperate. How many have we got? asks the Guinness lady. Two hundred and ninety-eight, calls the assistant. It’s enough, replies the Guinness lady. OK, she says, they can go. Given sanction, the Smurfs appear relieved. They begin disentangling themselves from their outfits even before leaving the pen. The Phrygian caps are the last to go.